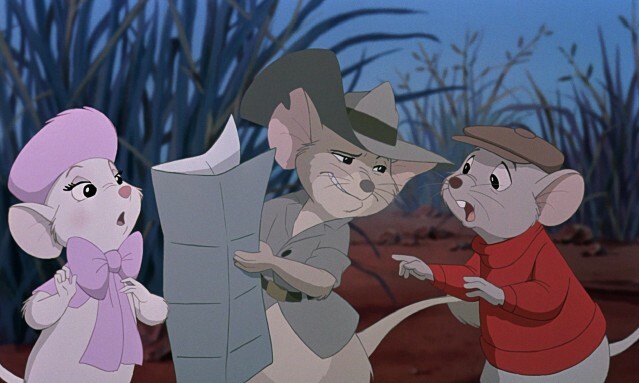 NOVEMBER DISNEY EXTRAVAGANZA #4: The Rescuers Down Under (1990) – dir. Hendel Butoy & Mike Gabriel | Films Like Dreams, Etc. Back at the very start of 2013, I watched the Disney animated classic The Rescuers (1977). While it’s not one that I would hold to as high regard as many others of the canon, I was still very captivated by its fun story, charming characters, and simplistic-yet-endearing animation. 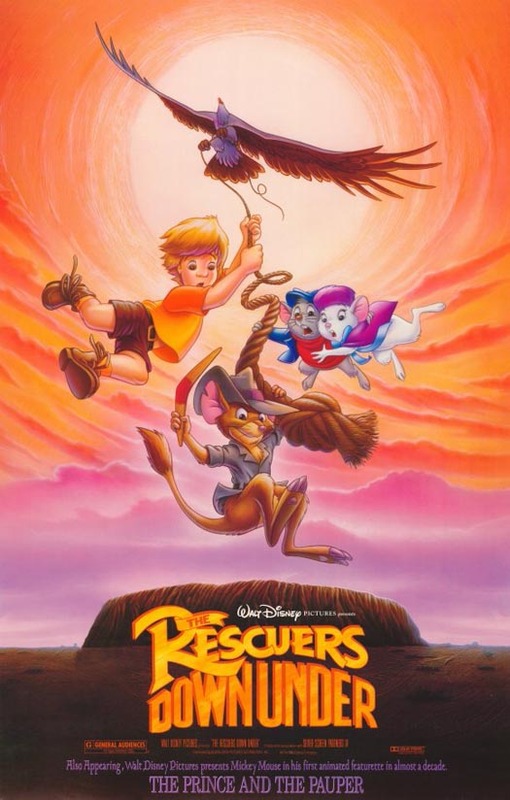 Since then, I’ve been hearing many positive things about The Rescuers Down Under, interesting both in its being the very first canonical sequel from the studio and also in the fact that it came an odd 13 years after its predecessor. Not only had I heard from many others that this was better than the original, but I also hold rather vague memories of enjoying this in my own childhood. Needless to say, a rewatch was in order. And thus, one could imagine my disappointment when it turned out that the sequel was instead relatively less captivating than the original Rescuers. Although first, it must be stated that its strongest aspect – hands down – is its breathtakingly beautiful animation. As opposed to the hand-drawn artwork found in the 1977 film (which is certainly charming in its own right), this film uses a more innovative combination of tradition and digital animation. As a result, the lines and colors look much more smoother, and background imagery especially is as gorgeous as ever. This is particularly noticeable in the film’s opening sequence, where we get many soaring shots of the Australian outback in all its colorful glory. 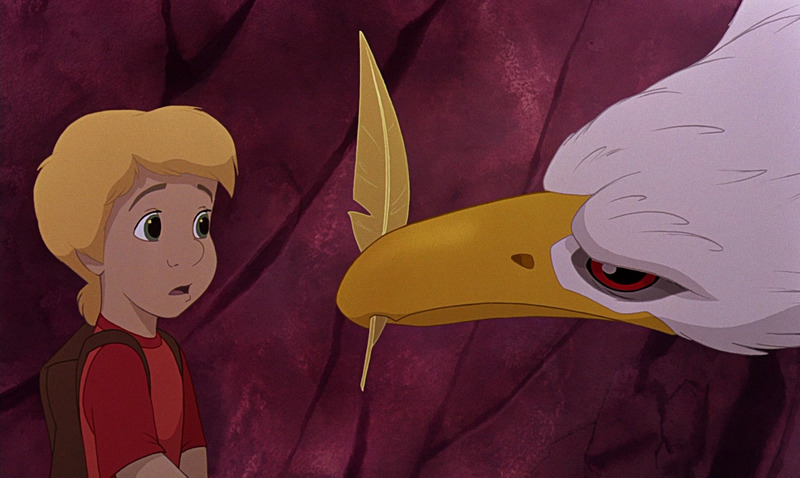 As a feat of animation, The Rescuers Down Under is certainly impressive. Unfortunately, it simply manages to hold up to such a standard on practically every other level. It’s true that it keeps its sense of strong simplicity and doesn’t run the potentially fatal risk of overcomplicating itself (an error that far too many lackluster sequels insist upon). Even still, many of the character elements that I found endearing in The Rescuers didn’t quite seem to measure up in Down Under. Bob Newhart and Eva Gabor reprised their roles, but the chemistry that made Bernard and Bianca a great team in the first film is seldom as strong here. The inclusion of the sidekick mouse Jake (voiced by Tristan Rogers) was a particularly annoying one as he didn’t contribute much to the overall product. The same goes for John Candy, which was even more disappointing since I usually find Candy so charming in movies. Finally, I was supremely distraught by just how unconvincing the villain was, especially since it’s the legendary George C. Scott who had offered his voice. McLeach in particular was just written in such a color-by-numbers fashion, with little to no believable motivation to his character other than to be as superficially evil as possible. I do have my minor annoyances with certain other elements of the film – such as how nearly all of the native Australian characters have Americanized accents – but I won’t go into too much detail with that. I don’t have any serious complaints about the story since it is still rather straight-forward, simple, and progresses decently. I just didn’t feel as excited or thrilled by the narrative as I was expecting. It’s an alright story, and coupled with the gorgeous animation it isn’t even a bad film necessarily. Where it falters the most is with its character development, which simply doesn’t come by as naturally as in the first Rescuers. It’s easy to see why and how I could have enjoyed this film as a kid; these days, however, I think this one viewing of The Rescuers Down Under is more than enough to hold me over. This entry was posted in November Disney Extravaganza, Reviews and tagged 1990's, animation, Disney, Hendel Butoy, Mike Gabriel, November Disney Extravaganza, The Rescuers Down Under. Bookmark the permalink.